Man Cave Madness is Here! New York, NY: Man Cave Health proudly announces its First Annual Man Cave Madness Fundraising Tournament, structured in the spirit of March Madness. This tournament aims to raise significant funds to be used in support of underwriting the opening of multiple man cave facilities across the country. Fundraising teams will compete against each other to raise the most amount of money throughout seven challenging rounds of competition to win the prestigious Man Cave Cup and $5,000. We invite teams to register at: https://mancavehealth.salsalabs.org/mancavemadnessp2pfundraiser/index.html in order to compete for the prestigious Man Cave Cup and Grand Prize of $5,000. The “Regular Season” of Man Cave Madness takes place between February 1, 2019 – March 17, 2019. 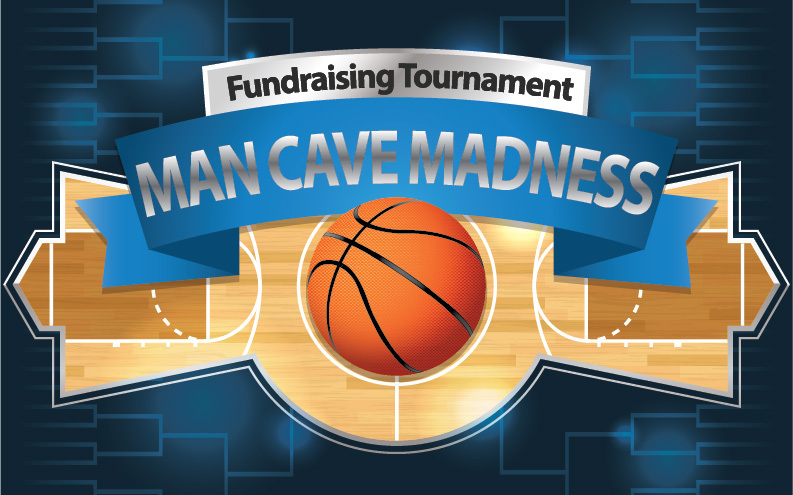 The 68 teams that raise the most money based on total funds contributed on their page at 5PM on March 17th will qualify for the Man Cave Madness Tournament. Teams will be divided up into four brackets based on seeding. At that point a head-to-head fundraising competition will begin. For example, the team that raised the most money will be seeded number 1. The team that raised the 68th most money will be seeded 68th. Once the tournament starts, the teams that are seeded 61, 62, 63, 64, 65, 66, 67 and 68th will compete against each other to qualify for the Round of 64. The winner of 64 vs. 65 will face the #1 seed in Bracket A in the Round of 64. The other teams in Bracket A will be seeds 8, 9, 16, 17, 24, 25, 32, 33, 40, 41, 48, 49, 56, 57. These teams will be seeded 1-16 within Bracket A. There will be no reseeding during the tournament. The brackets will hold through all rounds of the Man Cave Madness Tournament. The winner of 63 vs. 66 will face the #2 seed in Bracket B in the Round of 64. The other teams in Bracket B will be seeds 7,10, 15, 18, 23, 26, 31, 34, 39, 42, 47, 50, 55, 58. These teams will be seeded 1-16 within Bracket B. There will be no reseeding during the tournament. The brackets will hold through all rounds of the Mancave Madness Tournament. The winner of 62 vs. 67 will face the #3 seed in Bracket C in the Round of 64. The other teams in Bracket C will be seeds 6, 11, 14, 19, 22, 27, 30, 35, 38,43, 46, 51, 54 and 59. These teams will be seeded 1-16 within Bracket C. There will be no reseeding during the tournament. The brackets will hold through all rounds of the Mancave Madness Tournament. The winner of 61 vs. 68 will face the #4 seed in Bracket D in the Round of 64. The other teams in Bracket D will be seeds 5,12, 13, 20, 21, 28, 29, 36, 37, 44, 45, 52, 53, 60, 61. These teams will be seeded 1-16 within Bracket D. There will be no reseeding during the tournament. The brackets will hold through all rounds of the Mancave Madness Tournament. In each round of the tournament, the team whose page has the most money raised during the time allotted for each round, will win that round and advance to the next round. If two teams have raised the same amount of money in any round the team who reaches the amount of the tie first will win the tie-breaker. For example, if seed 2 raises $500 on March 22 and seed 7 raises $500 on March 21, and that is the only money raised by either team, seed 7 will win that round because their contribution came in first. The teams will be seeded and official brackets will be announced on SELECTION SUNDAY. The 61st seed will face-off versus the 68th seed. The 62nd seed will face-off versus the 67th seed. The 63rd seed will face-off versus the 66th seed. The 64th seed will face-off versus the 65th seed. The four teams that raise the most money in their bracket will advance to the round of 64. The ROUND OF 64 will commence at 9AM on MARCH 21 and will last until 10 PM on MARCH 22nd – The 32 teams that raise the most money in their individual bracketed competitions will advance to the round of 32. The 16 teams that raise the most money in their individual bracketed competitions will advance to the SWEET SIXTEEN. The SWEET SIXTEEN ROUND will commence at 12:01 am on March 25th and last until 10 PM, MARCH 29TH – The 8 teams that raise the most money in their individual bracketed competitions will advance to the ELITE EIGHT. The ELITE EIGHT ROUND will commence at 12:01 am on March 30th and last until 10 PM, MARCH 31ST – The 4 teams that raise the most money in their individual bracketed competitions will advance to the FINAL FOUR. The two teams that raise the most money in their individual bracketed competitions will advance to the MAN CAVE MADNESS Championship Round. The MAN CAVE MADNESS CHAMPIONSHIP ROUND will commence at 12:01 am on April 7th and last until 10 PM, APRIL 8TH – The team that raises the most money in the Championship Round will win the tournament, and receives the Man Cave Cup AND $5,000 CASH! Driven by the notion that “men take better care of their cars than they do their bodies”, Man Cave Health is breaking the silence surrounding sensitive health topics for men. There are approximately 3.7 billion men in the world, and they will die on average, almost 5 years earlier than women because they are less likely to seek preventive care for themselves. Nearly 81% of men remember the make & model of their first car, but barely half remember their last doctor visit. By brandingarc|2019-02-11T16:02:52-04:00February 1st, 2019|Company News|Comments Off on Man Cave Madness is Here!